I asked one player to grab his teammates to pose for a picture and I would toss it up on the How To Hockey Instagram page. The team was great, and I got them to all tag themselves in the picture before I posted it. The team in the picture above are OMHA champions. That means they went through the Ontario Minor Hockey Association playoffs and defeated every other team in their division. Sometimes this can lead to bitter rivals, fights, cheap shots, and boasting, however in this case it was the exact opposite (how hockey should always be!). After posting this picture I was tagged in another picture…. I love this picture because the teams are celebrating together. Instead of one team boasting at a win, and the other team being bitter because of a loss, the two teams come together and are both proud of their accomplishments. It’s great to see the captain of one team smiling and posing with the assistant from another team. This truly shows respect for the game, your team, and the other team. Yes, this is the assistant captain of the team who came in 2nd place commending the captain of the other team for his character and level of skill. This is what hockey should always be like. As a coach I am always trying to encourage respect for the game, the players, the officials and the other team. Isn’t it great to see a hard fought battle for the OMHA finals end with players from both teams coming together and encouraging each other. 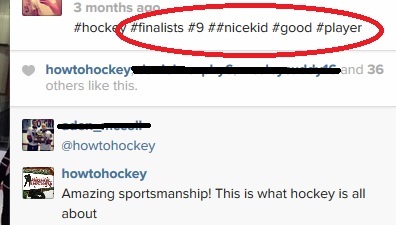 Every hockey player can learn from the positive attitude and sportsmanship that is displayed here. Too often (on the internet) I see players knocking others down (especially in Youtube comments) I would love for the trend of sportsmanship to spill over to the internet and see players encourage and lift up others. This is just one example I was very happy to come across. Much respect for the Ridgetown rebels and the Centre Hastings Grizzlies for your sportsmanship and respect in Hockey! Pass it on!